In the heart of the popular Raval neighbourhood, the Barcelona Museum of Contemporary Art, or MACBA, is a space of light, art and culture. 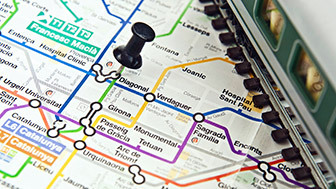 It was thanks to the fact that it opened in Raval, one of the Barcelona neighbourhoods with the most tradition and history, that the area became home to art centres and universities, making it one of the city's cultural landmarks. The creation of this museum was a long-held dream that finally came true. In 1953, writer and art critic Alexandre Cirici created the Associació d’Artistes Actuals (Association of Contemporary Artists) with the aim of bringing contemporary art together in a single space, as had already been done at the Museum of Modern Art in New York, the famous MOMA. However, it was not until 1987 that this idea became a reality when architect Richard Meier was commissioned to build a unique building in which to house it. The MACBA is located in the Raval neighbourhood, in Plaça dels Àngels, a bright, light space measuring some 14,000 square metres, which was the first step in the process of redeveloping the area. 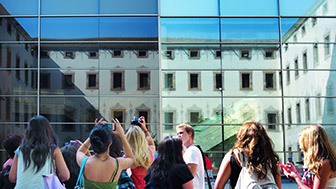 Meier's modern and rationalist architecture, with a very light building, made from glass, metal and reflective elements, contrasts with the placidness and Gothic sobriety of the Convent dels Àngels, one of the buildings integrated into the MACBA which hosts exhibitions, and the Alexandre Cirici Document Centre, with a collection of more than 64,000 documents. The MACBA collection, which includes 5,500 works by different artists, offers a journey through art from the abstract art of the mid 20th century, through European pop art and the new avant-garde, up to the present day. 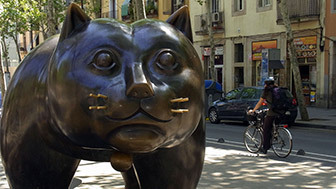 The collection includes works by distinguished local artists, such as Joan Miró, Antoni Tàpies, Joan Brossa, Joan Ponç, the Dau al Set collective, Josep Maria Subirachs, Jaume Plensa and the Mallorcan artist Miquel Barceló. It also has work by national and international artists, particularly South Americans and artists from Eastern countries, including works from distinguished artists such as the Equipo Crónica collective, Jorge Oteiza, Alexander Calder, Andy Warhol, Gordon Matta-Clark and Jean-Michel Basquiat, among many others. The MACBA forms part of the Raval Cultural project, which aims to provide everyone with access to the neighbourhood's artistic and cultural heritage. Alongside this initiative, the MACBA celebrated the 25th anniversary of the mural produced by Keith Haring in 1989, as part of the fight against AIDS, by restoring it. Barcelona's contemporary culture is on display in this building in the Raval neighbourhood.